Question Time is a series in which we open up the floor to you, commenters. We invite you to share as you feel comfortable. From cooking to laundry to repairs, doing things around the house can be pretty tricky and/or exhausting and/or time consuming when you’re disabled. If you’ve any tips to share that can make your fellow readers’ lives a little easier, share them with us. If you have suggestions for Question Times, send them to chally at disabledfeminists dot com. Question Time: How do you cope with the weather? Well, we’re getting well into winter here and different bits of me are aching. Winter is not my fun time. My questions to you are: do you have problems with the weather, maybe excessive heat or cold or rain? How do you deal with that? How important is being in community with other disabled people to you? Where do you find community with other disabled people? How do these communities fit in with other ones in your life? Are there any disability rights activists of whose work you are a particular fan? They can be prominent or someone you know if your personal life, anyone whose activism you admire. Are there any “shortcuts” to save time/energy/et cetera that you make use of in daily life? How did you discover or hear about them? How do they help with your condition(s), if at all? What does accessibility mean to you? That is, how do you define it and what does it mean in your life? If you’re out and about at all, you’ll run into small talk situations. Perhaps at the checkout, perhaps getting coffee, perhaps at the library, perhaps at school or playgroup or college or perhaps at a party or dinner, or in the staffroom at work or with customers. What sort of small talk happens, for you, if any? What would you like to happen? How does your disability inflect your small talk, and affect your ability to participate? 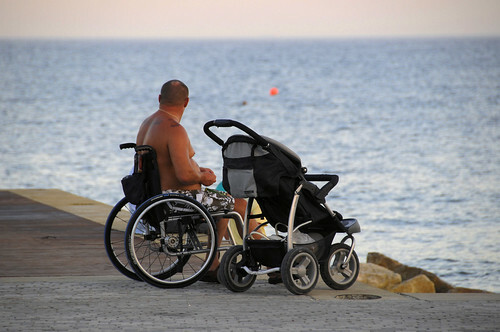 Have people – strangers or acquaintances – asked you about your disability? How do you feel about that? What would your ideal small-talk world look like? How does ableism intersect with any other oppressions you experience? We’ve covered gender in the past, and now I’m wondering how disability interacts with other issues in your life. For example, maybe people think your queerness is fake because you’ve a mental illness. What can you think of?